Human rights activists, as well as some activists supporting the ongoing hostile campaign of separatist fighters against the Cameroon government, have condemned acts of some fighters who have been attacking and cutting off hands and fingers of Cameroon Development Corporation, CDC, workers for not heeding their calls. 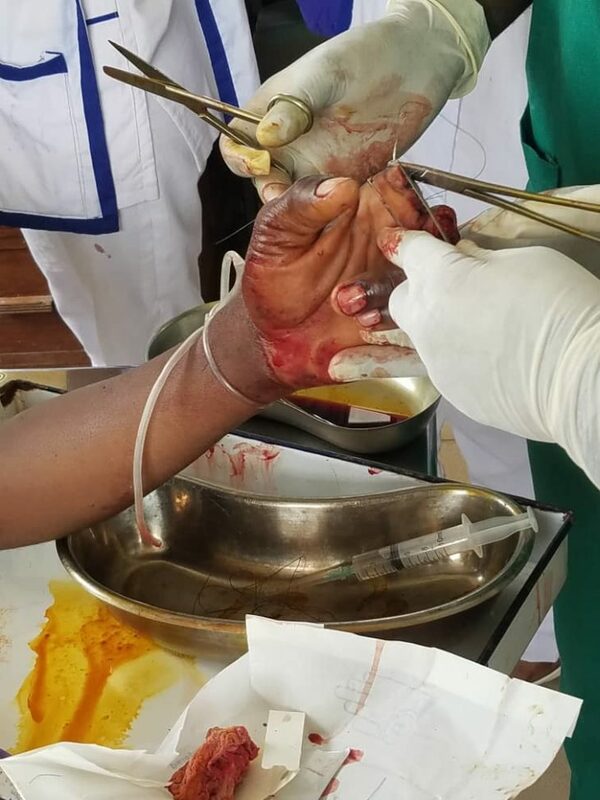 The condemnation came after suspected fighters attacked six persons they presumed were workers of the CDC in Tiko, and chopped off fingers and hands of some. The victims of the attack were ferried to the Tiko district hospital, where they were attended to. The six victims of the February 19 attack are the latest of similar attacks launched by suspected separatist fighters with the aim of discouraging the thousands of workers of the State Corporation from working. The aim of the campaign, is said to be the total crippling of the activities of the CDC, so as to boost influence and control in the troubled regions of Cameroon. Some accounts hold that the victims of the recent attack are not CDC workers, but rather work for a different company. He lamented saying that the concerned are merely trying to survive like any person will, given the circumstances of the current crisis with its overbearing suffering. In other outings, some activists and promoters of the Ambazonia agenda signed a statement condemning the acts, saying that their ‘legitimate’ fight is against President Biya and his soldiers. They further stated that the fighters, in their operations, must protect women and children, as well as respect human dignity and “fight for freedom in accordance with national and international laws. Self-defense tactics do not include maiming,” they said. A statement issued by Agbor Balla’s Centre for Human Rights and Democracy in Africa, CHRDA, it said CHRDA abhors the indiscriminate attack on plantation workers in Likomba, Tiko. The centre described the acts as cruel, inhuman and degrading, and that it constitutes gross human rights abuse and in violation of rule of law and international humanitarian law that is applicable to non-international armed conflicts. The centre urged the armed fighters, as well as Government forces to exercise caution, moderation, and proportionality and ensure the protection of the civilian population. I just want to say I am just newbie to weblog and absolutely loved this web-site. Very likely I’m going to bookmark your blog . You actually have awesome posts. With thanks for sharing with us your website. My husband and i were very lucky when Ervin could deal with his investigation through your precious recommendations he was given from your very own blog. It is now and again perplexing to just choose to be giving away methods that the rest might have been selling. We really already know we have got the blog owner to be grateful to because of that. Most of the explanations you made, the easy web site navigation, the relationships you will make it easier to promote – it’s got all astounding, and it’s aiding our son in addition to our family understand this issue is enjoyable, and that’s truly fundamental. Thank you for everything! A lot of thanks for all of the hard work on this site. Gloria takes pleasure in managing research and it is simple to grasp why. Most people hear all regarding the compelling form you make reliable things on your blog and in addition invigorate response from people on this theme and our own princess is always discovering a whole lot. Have fun with the rest of the new year. Your carrying out a first class job. My spouse and i were really happy when Ervin could finish off his web research from your precious recommendations he obtained from your very own web pages. It’s not at all simplistic just to happen to be making a gift of strategies some other people may have been making money from. Therefore we keep in mind we have got the writer to be grateful to for that. All the illustrations you have made, the straightforward blog navigation, the relationships you can make it possible to promote – it’s everything excellent, and it is aiding our son and our family feel that that theme is exciting, and that’s extraordinarily mandatory. Many thanks for everything! I as well as my friends have been examining the excellent ideas from the website while before long developed a horrible suspicion I never thanked the blog owner for those tips. Most of the guys became for this reason glad to see them and have in effect in fact been using these things. Appreciate your simply being simply accommodating as well as for settling on these kinds of essential ideas millions of individuals are really wanting to discover. My sincere apologies for not saying thanks to you sooner. I have to get across my love for your generosity supporting women who absolutely need help on the field. Your real commitment to passing the message across appeared to be amazingly invaluable and has continually helped those just like me to achieve their aims. Your new valuable help indicates so much to me and further more to my mates. Thanks a lot; from everyone of us. Very efficiently written article. It will be useful to everyone who utilizes it, including myself. Keep doing what you are doing – looking forward to more posts. I and also my buddies have already been digesting the good helpful tips located on your site then suddenly I got a horrible feeling I never thanked the website owner for those tips. All of the young boys came consequently passionate to read through them and have in effect really been taking advantage of these things. Appreciation for genuinely quite helpful and then for considering these kinds of excellent tips most people are really needing to learn about. My very own sincere apologies for not expressing appreciation to earlier. Great post. I was checking continuously this blog and I am impressed! Very useful information specially the last part 🙂 I care for such info much. I was looking for this particular info for a very long time. Thank you and good luck. It¡¦s in point of fact a nice and helpful piece of information. I am happy that you just shared this useful information with us. Please keep us informed like this. Thanks for sharing. I wanted to draft you this tiny observation just to give many thanks yet again for your pleasant ideas you’ve discussed on this page. It’s so extremely generous of you to convey easily all that many individuals might have distributed as an e-book to help with making some profit for themselves, particularly seeing that you could have tried it in case you decided. Those thoughts likewise served as a good way to know that the rest have the identical zeal the same as my own to know the truth a whole lot more when considering this condition. I am certain there are several more pleasurable opportunities up front for individuals who view your blog post. Hello.This article was really fascinating, particularly since I was browsing for thoughts on this issue last Friday. I¡¦ve been exploring for a bit for any high-quality articles or blog posts in this kind of space . Exploring in Yahoo I ultimately stumbled upon this web site. Studying this info So i¡¦m glad to show that I’ve an incredibly good uncanny feeling I discovered exactly what I needed. I most certainly will make sure to don¡¦t omit this website and provides it a glance regularly. I in addition to my pals have already been taking note of the good information on your site while unexpectedly I got a horrible suspicion I had not thanked the web blog owner for those strategies. Those women are actually certainly passionate to study all of them and have now really been tapping into these things. Appreciation for really being considerably accommodating and also for figuring out these kinds of ideal tips most people are really wanting to discover. Our own sincere regret for not expressing appreciation to you sooner. Usually I do not read article on blogs, however I wish to say that this write-up very forced me to try and do it! Your writing taste has been surprised me. Thanks, very great article. I am only commenting to let you know of the perfect discovery my child obtained studying your blog. She mastered plenty of issues, with the inclusion of what it’s like to have an awesome helping style to make men and women clearly fully understand some extremely tough subject areas. You truly did more than readers’ expected results. Thanks for showing these good, dependable, informative and as well as easy thoughts on this topic to Sandra. wonderful issues altogether, you just gained a new reader. What might you suggest in regards to your put up that you simply made a few days in the past? Any positive? Thanks for your own labor on this web site. Debby really loves carrying out research and it’s really easy to see why. My spouse and i hear all regarding the powerful form you deliver both useful and interesting things by means of the web site and foster contribution from other individuals on the area of interest so my child is without question learning so much. Take pleasure in the remaining portion of the year. You are carrying out a splendid job. I just wanted to send a quick note to be able to thank you for those fabulous hints you are giving at this site. My prolonged internet search has at the end of the day been recognized with useful facts to share with my family. I would believe that many of us website visitors are rather lucky to dwell in a useful website with many wonderful professionals with beneficial plans. I feel very happy to have seen your entire web pages and look forward to many more pleasurable times reading here. Thank you again for all the details. Wow, incredible weblog layout! How lengthy have you ever been blogging for? you made running a blog look easy. The overall glance of your site is excellent, as well as the content! I precisely desired to thank you so much once more. I do not know the things that I would’ve tried in the absence of these thoughts discussed by you concerning such a theme. It had been the daunting issue in my circumstances, nevertheless finding out a professional mode you handled that forced me to leap with gladness. I am just grateful for this help and in addition hope that you are aware of an amazing job that you are accomplishing teaching people today via your site. More than likely you’ve never come across all of us. I’m also commenting to let you know of the useful experience my cousin’s princess encountered browsing your blog. She even learned plenty of details, which include how it is like to have an ideal teaching mood to get the mediocre ones smoothly know just exactly a number of very confusing matters. You undoubtedly surpassed readers’ expectations. Thanks for coming up with such informative, safe, explanatory and even unique tips about this topic to Sandra. I simply want to tell you that I’m beginner to blogs and actually enjoyed your web blog. Very likely I’m want to bookmark your blog . You actually have fabulous articles. Regards for revealing your web-site. I must point out my love for your kind-heartedness in support of individuals who actually need help with this one idea. Your real commitment to getting the message along turned out to be particularly informative and has without exception made some individuals like me to realize their endeavors. Your new informative facts entails so much to me and far more to my office workers. Best wishes; from everyone of us. I would like to thank you for the efforts you have put in writing this blog. I am hoping the same high-grade blog post from you in the upcoming as well. Actually your creative writing skills has encouraged me to get my own site now. Actually the blogging is spreading its wings fast. Your write up is a good example of it. Thanks a lot for giving everyone an extremely splendid possiblity to read articles and blog posts from this website. It’s usually so ideal and as well , jam-packed with fun for me personally and my office colleagues to search your site minimum thrice every week to read the latest items you have. And of course, we’re always motivated for the awesome advice served by you. Some 2 ideas on this page are indeed the most impressive I have had. Thanks for another informative site. Where else could I am getting that kind of info written in such a perfect way? I’ve a project that I’m just now running on, and I have been at the glance out for such information. I wanted to send a simple message to be able to appreciate you for some of the marvelous guidelines you are showing on this website. My considerable internet look up has at the end of the day been rewarded with reliable facts and techniques to talk about with my good friends. I would state that that most of us visitors actually are very much fortunate to be in a magnificent community with so many wonderful professionals with valuable techniques. I feel somewhat privileged to have encountered your entire web site and look forward to many more exciting minutes reading here. Thank you once again for all the details. Thanks , I have just been searching for info about this topic for a while and yours is the best I’ve discovered till now. But, what concerning the bottom line? Are you positive in regards to the supply? Thank you for each of your work on this web page. Gloria enjoys doing research and it is obvious why. A lot of people notice all concerning the dynamic ways you convey very useful guidance through the blog and as well welcome contribution from other ones on that idea so my daughter is in fact learning so much. Take advantage of the rest of the new year. You are always carrying out a stunning job. Thanks a lot for sharing this with all folks you really recognise what you’re speaking about! Bookmarked. Please additionally consult with my website =). We will have a hyperlink trade contract among us! I do trust all of the ideas you have presented for your post. They’re really convincing and will definitely work. Still, the posts are very quick for newbies. May you please prolong them a little from next time? Thanks for the post. I simply wanted to write down a simple comment to be able to thank you for all the pleasant points you are placing at this site. My particularly long internet look up has at the end been rewarded with really good ideas to go over with my companions. I ‘d express that most of us site visitors actually are extremely lucky to live in a wonderful place with so many brilliant people with helpful suggestions. I feel very privileged to have seen your web pages and look forward to tons of more brilliant moments reading here. Thanks a lot once more for a lot of things. Hello there, I found your blog by the use of Google while looking for a related matter, your website got here up, it appears good. I have bookmarked it in my google bookmarks. Hiya, I’m really glad I’ve found this info. Nowadays bloggers publish only about gossip and internet stuff and this is really frustrating. A good site with exciting content, this is what I need. Thank you for making this web-site, and I’ll be visiting again. Do you do newsletters by email? Simply want to say your article is as astonishing. The clearness in your post is simply great and i could assume you’re an expert on this subject. Fine with your permission let me to grab your RSS feed to keep updated with forthcoming post. Thanks a million and please continue the gratifying work. I happen to be commenting to make you be aware of of the brilliant discovery my cousin’s princess obtained going through your webblog. She mastered so many things, not to mention how it is like to possess an excellent giving style to get many others with ease fully understand specified tricky subject matter. You undoubtedly exceeded our desires. Many thanks for coming up with these practical, healthy, educational and also fun thoughts on your topic to Gloria. Hey there. I discovered your blog by means of Google whilst searching for a similar subject, your site got here up. It appears good. I’ve bookmarked it in my google bookmarks to come back then. Hiya, I am really glad I have found this info. Nowadays bloggers publish only about gossip and web stuff and this is really frustrating. A good web site with exciting content, that is what I need. Thanks for making this web-site, and I will be visiting again. Do you do newsletters by email? Hiya, I’m really glad I have found this information. Today bloggers publish only about gossip and web stuff and this is actually annoying. A good web site with interesting content, that is what I need. Thanks for making this web site, and I will be visiting again. Do you do newsletters by email? Hiya, I’m really glad I have found this info. Today bloggers publish only about gossip and web stuff and this is really frustrating. A good web site with interesting content, that is what I need. Thanks for making this web-site, and I’ll be visiting again. Do you do newsletters by email? I and also my buddies came looking at the good guides from your site and at once came up with an awful suspicion I never expressed respect to you for those tips. All of the guys were as a consequence very interested to see them and now have undoubtedly been loving those things. I appreciate you for simply being indeed thoughtful and then for opting for this sort of useful issues millions of individuals are really wanting to understand about. Our sincere apologies for not expressing gratitude to sooner. Hey there. I found your site via Google while searching for a comparable matter, your website came up. It seems great. I have bookmarked it in my google bookmarks to visit then. Hello.This post was really motivating, especially because I was searching for thoughts on this matter last couple of days. Hello there. I found your web site by way of Google while looking for a comparable subject, your site got here up. It seems great. I have bookmarked it in my google bookmarks to visit then. Hi there. I discovered your site by the use of Google even as looking for a similar matter, your website got here up. It appears to be good. I’ve bookmarked it in my google bookmarks to visit then. Hiya, I’m really glad I’ve found this info. Nowadays bloggers publish only about gossip and internet stuff and this is really frustrating. A good blog with interesting content, this is what I need. Thank you for making this website, and I will be visiting again. Do you do newsletters by email? Hiya, I am really glad I have found this info. Today bloggers publish only about gossip and web stuff and this is actually frustrating. A good site with exciting content, this is what I need. Thank you for making this website, and I will be visiting again. Do you do newsletters by email? Hi there. I discovered your blog via Google even as searching for a similar matter, your website got here up. It seems to be good. I have bookmarked it in my google bookmarks to come back then. Hi there. I found your website by the use of Google whilst searching for a comparable subject, your web site got here up. It appears great. I’ve bookmarked it in my google bookmarks to visit then. Hello there. I discovered your blog by means of Google while searching for a related topic, your website got here up. It seems to be good. I have bookmarked it in my google bookmarks to come back then. Hey there. I found your site by the use of Google while looking for a similar subject, your website came up. It appears good. I have bookmarked it in my google bookmarks to visit then. Hiya, I’m really glad I have found this information. Today bloggers publish only about gossip and internet stuff and this is actually annoying. A good blog with interesting content, that’s what I need. Thank you for making this website, and I’ll be visiting again. Do you do newsletters by email? Hi there. I discovered your web site by the use of Google at the same time as searching for a similar subject, your website came up. It seems to be great. I have bookmarked it in my google bookmarks to visit then. Hey there. I found your web site by way of Google even as searching for a related subject, your site came up. It appears great. I’ve bookmarked it in my google bookmarks to visit then. Hello there. I found your website by means of Google even as looking for a related subject, your site came up. It appears great. I’ve bookmarked it in my google bookmarks to come back then. I enjoy you because of every one of your work on this web page. My mother delights in engaging in research and it’s really easy to see why. My partner and i learn all about the powerful way you convey invaluable techniques via your website and as well as encourage participation from other people on this area then our own child has been learning a great deal. Have fun with the remaining portion of the new year. You have been carrying out a tremendous job. Hey there. I discovered your web site via Google while looking for a similar matter, your site came up. It looks good. I’ve bookmarked it in my google bookmarks to visit then. I precisely needed to say thanks again. I’m not certain what I would’ve accomplished without the actual ideas documented by you relating to such a theme. It was a intimidating problem in my circumstances, but understanding the specialized fashion you dealt with it made me to jump over fulfillment. Now i am happy for the service and even hope you find out what an amazing job you have been putting in teaching people by way of your site. More than likely you have never encountered any of us. Hiya, I’m really glad I’ve found this information. Today bloggers publish only about gossip and internet stuff and this is actually frustrating. A good website with interesting content, that’s what I need. Thank you for making this web site, and I will be visiting again. Do you do newsletters by email? Hey there. I found your blog via Google at the same time as looking for a similar subject, your website came up. It seems to be good. I’ve bookmarked it in my google bookmarks to come back then. Great awesome issues here. I¡¦m very happy to look your article. Thank you so much and i am looking ahead to touch you. Will you kindly drop me a mail? Fantastic web site. Lots of useful info here. I am sending it to several pals ans also sharing in delicious. And of course, thanks on your sweat! Hiya, I am really glad I’ve found this information. Nowadays bloggers publish only about gossip and internet stuff and this is actually irritating. A good web site with exciting content, this is what I need. Thanks for making this web site, and I will be visiting again. Do you do newsletters by email? Hiya, I am really glad I’ve found this info. Today bloggers publish just about gossip and net stuff and this is really frustrating. A good site with interesting content, that’s what I need. Thank you for making this web-site, and I will be visiting again. Do you do newsletters by email? Hey there. I discovered your web site by way of Google at the same time as looking for a related subject, your website got here up. It seems great. I’ve bookmarked it in my google bookmarks to come back then. Hi there. I found your web site by means of Google at the same time as searching for a comparable matter, your site came up. It appears to be great. I have bookmarked it in my google bookmarks to come back then. Hi there. I found your website via Google while searching for a similar subject, your web site got here up. It appears good. I’ve bookmarked it in my google bookmarks to come back then. Hiya, I’m really glad I’ve found this info. Today bloggers publish only about gossip and web stuff and this is actually annoying. A good blog with interesting content, this is what I need. Thank you for making this website, and I will be visiting again. Do you do newsletters by email? I have been exploring for a little bit for any high quality articles or blog posts on this kind of area . Exploring in Yahoo I finally stumbled upon this website. Studying this info So i¡¦m glad to exhibit that I have an incredibly excellent uncanny feeling I came upon just what I needed. I so much indisputably will make sure to do not disregard this site and give it a glance on a continuing basis. Hi there. I found your web site by the use of Google at the same time as looking for a related matter, your site came up. It looks good. I’ve bookmarked it in my google bookmarks to visit then. Hiya, I am really glad I have found this info. Nowadays bloggers publish only about gossip and internet stuff and this is actually frustrating. A good blog with interesting content, that is what I need. Thank you for making this web site, and I’ll be visiting again. Do you do newsletters by email? Hiya, I am really glad I have found this information. Today bloggers publish only about gossip and web stuff and this is actually irritating. A good blog with interesting content, this is what I need. Thank you for making this website, and I will be visiting again. Do you do newsletters by email? Whats Going down i’m new to this, I stumbled upon this I have discovered It positively helpful and it has helped me out loads. I am hoping to contribute & assist other customers like its helped me. Good job. hello there and thank you for your information – I’ve certainly picked up anything new from right here. I did however expertise a few technical issues using this site, since I experienced to reload the site many times previous to I could get it to load properly. I had been wondering if your hosting is OK? Not that I’m complaining, but sluggish loading instances times will sometimes affect your placement in google and could damage your high-quality score if advertising and marketing with Adwords. Well I’m adding this RSS to my email and can look out for a lot more of your respective fascinating content. Ensure that you update this again soon.. I precisely wanted to say thanks yet again. I am not sure the things I would have achieved without the entire advice discussed by you relating to such area of interest. This has been an absolute horrifying crisis for me, but encountering this expert style you treated that made me to weep with joy. I’m just thankful for this assistance and pray you find out what a powerful job you were providing instructing the others through the use of a web site. I am certain you have never come across all of us. I happen to be writing to let you understand of the great encounter my girl developed reading through your web site. She even learned several issues, with the inclusion of how it is like to have an amazing teaching heart to make a number of people quite simply fully understand selected tortuous subject matter. You truly exceeded our own desires. I appreciate you for showing these powerful, healthy, explanatory not to mention fun tips on the topic to Jane. Hiya, I am really glad I’ve found this information. Nowadays bloggers publish only about gossip and net stuff and this is actually annoying. A good site with exciting content, that is what I need. Thanks for making this web site, and I will be visiting again. Do you do newsletters by email? Hello there. I found your web site by way of Google while searching for a related subject, your web site came up. It seems good. I’ve bookmarked it in my google bookmarks to come back then. Hiya, I’m really glad I have found this information. Nowadays bloggers publish only about gossip and web stuff and this is actually irritating. A good web site with interesting content, this is what I need. Thank you for making this web site, and I’ll be visiting again. Do you do newsletters by email? Hello there. I found your website by the use of Google while looking for a related matter, your website came up. It seems great. I have bookmarked it in my google bookmarks to come back then. Hey there. I discovered your site by means of Google even as looking for a related subject, your web site came up. It seems to be great. I have bookmarked it in my google bookmarks to visit then. Hiya, I’m really glad I have found this info. Nowadays bloggers publish only about gossip and net stuff and this is actually annoying. A good web site with interesting content, this is what I need. Thanks for making this site, and I’ll be visiting again. Do you do newsletters by email? Hey there. I found your blog via Google whilst looking for a similar topic, your website got here up. It looks good. I have bookmarked it in my google bookmarks to come back then. Hi there. I discovered your blog via Google at the same time as searching for a related subject, your website got here up. It looks great. I have bookmarked it in my google bookmarks to come back then. Hi there. I discovered your web site by the use of Google even as searching for a similar topic, your website came up. It seems to be good. I have bookmarked it in my google bookmarks to come back then. Hello there. I discovered your site by way of Google at the same time as searching for a similar matter, your website got here up. It appears good. I have bookmarked it in my google bookmarks to come back then. Hiya, I am really glad I’ve found this info. Today bloggers publish just about gossip and net stuff and this is really irritating. A good blog with interesting content, that’s what I need. Thanks for making this web-site, and I’ll be visiting again. Do you do newsletters by email? Hiya, I am really glad I’ve found this information. Nowadays bloggers publish just about gossip and web stuff and this is actually frustrating. A good site with interesting content, this is what I need. Thank you for making this web-site, and I will be visiting again. Do you do newsletters by email? Hi there. I found your website by means of Google even as searching for a comparable matter, your web site got here up. It looks great. I’ve bookmarked it in my google bookmarks to come back then. Hello there. I found your blog by way of Google while looking for a similar subject, your site came up. It looks good. I’ve bookmarked it in my google bookmarks to visit then. Hello there. I found your website by way of Google at the same time as searching for a related subject, your site got here up. It seems to be great. I’ve bookmarked it in my google bookmarks to visit then. Hi there. I found your web site by the use of Google at the same time as searching for a similar topic, your site got here up. It seems good. I have bookmarked it in my google bookmarks to visit then. Hiya, I am really glad I have found this info. Nowadays bloggers publish only about gossip and internet stuff and this is really annoying. A good site with exciting content, that is what I need. Thank you for making this website, and I’ll be visiting again. Do you do newsletters by email? Hey there. I found your website by the use of Google at the same time as looking for a related matter, your web site came up. It looks great. I have bookmarked it in my google bookmarks to visit then. Hi there. I discovered your web site by the use of Google while searching for a comparable subject, your web site came up. It looks great. I have bookmarked it in my google bookmarks to visit then. Hello there. I discovered your web site via Google even as looking for a comparable matter, your website got here up. It appears great. I have bookmarked it in my google bookmarks to visit then. Hi there. I found your site by means of Google at the same time as searching for a similar matter, your web site got here up. It seems to be great. I’ve bookmarked it in my google bookmarks to come back then. Hello there. I discovered your blog by the use of Google at the same time as looking for a comparable topic, your site got here up. It seems to be great. I’ve bookmarked it in my google bookmarks to visit then. Hiya, I am really glad I’ve found this information. Nowadays bloggers publish just about gossip and net stuff and this is really frustrating. A good blog with interesting content, that’s what I need. Thank you for making this web-site, and I will be visiting again. Do you do newsletters by email? Hiya, I’m really glad I have found this info. Nowadays bloggers publish just about gossip and internet stuff and this is really irritating. A good website with interesting content, this is what I need. Thanks for making this web-site, and I’ll be visiting again. Do you do newsletters by email? Hi there. I found your website by means of Google while searching for a comparable topic, your web site got here up. It appears to be great. I have bookmarked it in my google bookmarks to visit then. Hi there. I found your blog by the use of Google whilst searching for a related matter, your site came up. It appears great. I have bookmarked it in my google bookmarks to visit then. Hiya, I’m really glad I’ve found this info. Nowadays bloggers publish only about gossip and net stuff and this is actually frustrating. A good blog with interesting content, this is what I need. Thank you for making this web-site, and I’ll be visiting again. Do you do newsletters by email? Hiya, I’m really glad I have found this information. Nowadays bloggers publish just about gossip and internet stuff and this is actually frustrating. A good site with exciting content, this is what I need. Thanks for making this site, and I will be visiting again. Do you do newsletters by email? Hey there. I discovered your website by the use of Google at the same time as searching for a related topic, your website got here up. It appears to be great. I’ve bookmarked it in my google bookmarks to visit then. Hi there. I discovered your blog by the use of Google even as looking for a related matter, your site got here up. It appears good. I have bookmarked it in my google bookmarks to come back then. Thanks for all your valuable efforts on this website. Gloria loves making time for research and it’s easy to understand why. We hear all of the lively medium you convey advantageous tips and hints on this web blog and therefore improve participation from other people on the point plus my princess is in fact understanding a lot. Enjoy the rest of the year. You are always doing a superb job. Useful info. Lucky me I found your web site accidentally, and I’m surprised why this accident didn’t happened in advance! I bookmarked it. Thanks so much for giving everyone such a nice chance to check tips from this web site. It’s always so ideal and as well , jam-packed with a great time for me personally and my office fellow workers to search your blog not less than three times in 7 days to learn the fresh things you will have. Not to mention, I’m so usually motivated for the good opinions you give. Selected 3 facts in this article are really the most efficient I have had. Hiya, I am really glad I’ve found this info. Nowadays bloggers publish just about gossip and net stuff and this is actually frustrating. A good blog with interesting content, this is what I need. Thanks for making this site, and I’ll be visiting again. Do you do newsletters by email? You completed a number of good points there. I did a search on the subject and found the majority of persons will consent with your blog. Hiya, I’m really glad I’ve found this info. Nowadays bloggers publish just about gossip and internet stuff and this is actually irritating. A good website with interesting content, that’s what I need. Thank you for making this web-site, and I will be visiting again. Do you do newsletters by email? Hello there. I discovered your web site by the use of Google even as searching for a comparable matter, your site got here up. It seems great. I’ve bookmarked it in my google bookmarks to come back then. Hi there. I found your blog by means of Google at the same time as looking for a related matter, your website came up. It seems great. I’ve bookmarked it in my google bookmarks to visit then. Hiya, I’m really glad I have found this info. Nowadays bloggers publish only about gossip and web stuff and this is actually irritating. A good blog with interesting content, that is what I need. Thank you for making this website, and I will be visiting again. Do you do newsletters by email? Hiya, I’m really glad I have found this information. Today bloggers publish only about gossip and internet stuff and this is actually annoying. A good site with exciting content, that’s what I need. Thank you for making this web-site, and I’ll be visiting again. Do you do newsletters by email? I¡¦ll right away grasp your rss feed as I can’t to find your e-mail subscription link or e-newsletter service. Do you have any? Please allow me recognise in order that I may just subscribe. Thanks. Hi there. I discovered your blog via Google whilst searching for a similar topic, your web site came up. It seems great. I’ve bookmarked it in my google bookmarks to come back then. Hey there. I found your website by means of Google while searching for a related topic, your site came up. It seems to be good. I have bookmarked it in my google bookmarks to visit then. Hiya, I am really glad I’ve found this info. Nowadays bloggers publish just about gossip and web stuff and this is really frustrating. A good blog with interesting content, this is what I need. Thank you for making this website, and I will be visiting again. Do you do newsletters by email? I just want to say I am just newbie to blogs and definitely loved your blog. Very likely I’m likely to bookmark your site . You definitely come with tremendous writings. Appreciate it for revealing your web-site. Hey there. I discovered your website by the use of Google while looking for a similar matter, your web site got here up. It seems to be great. I’ve bookmarked it in my google bookmarks to come back then. Hiya, I am really glad I have found this information. Nowadays bloggers publish only about gossip and net stuff and this is really annoying. A good web site with exciting content, that is what I need. Thank you for making this website, and I’ll be visiting again. Do you do newsletters by email? Hey there. I found your blog by the use of Google even as searching for a related matter, your web site got here up. It seems good. I’ve bookmarked it in my google bookmarks to come back then. Hiya, I am really glad I’ve found this information. Today bloggers publish just about gossip and web stuff and this is actually irritating. A good blog with interesting content, that is what I need. Thank you for making this web-site, and I’ll be visiting again. Do you do newsletters by email? Hiya, I am really glad I’ve found this info. Today bloggers publish only about gossip and web stuff and this is actually annoying. A good website with interesting content, that’s what I need. Thanks for making this site, and I’ll be visiting again. Do you do newsletters by email? Hiya, I’m really glad I’ve found this information. Today bloggers publish only about gossip and internet stuff and this is really frustrating. A good blog with interesting content, that’s what I need. Thanks for making this web site, and I’ll be visiting again. Do you do newsletters by email? My husband and i have been now joyful Ervin managed to finish off his studies through your precious recommendations he made using your web site. It is now and again perplexing to simply possibly be giving away key points men and women have been trying to sell. And we also grasp we’ve got the blog owner to appreciate for this. Those illustrations you’ve made, the simple blog navigation, the relationships you can help create – it’s got all excellent, and it’s assisting our son and the family imagine that the matter is fun, and that is very vital. Many thanks for the whole thing! Hiya, I’m really glad I’ve found this info. Nowadays bloggers publish just about gossip and internet stuff and this is actually annoying. A good blog with interesting content, that is what I need. Thanks for making this web-site, and I will be visiting again. Do you do newsletters by email? Hey there. I found your website by the use of Google whilst looking for a comparable topic, your web site got here up. It seems good. I’ve bookmarked it in my google bookmarks to come back then. Hiya, I’m really glad I’ve found this info. Nowadays bloggers publish just about gossip and net stuff and this is actually annoying. A good site with interesting content, that’s what I need. Thanks for making this web-site, and I will be visiting again. Do you do newsletters by email? Hello there. I found your web site by way of Google whilst searching for a related matter, your website got here up. It looks great. I’ve bookmarked it in my google bookmarks to visit then. Hello there. I found your web site by way of Google whilst searching for a related subject, your web site got here up. It appears good. I have bookmarked it in my google bookmarks to come back then. Hi there. I discovered your web site via Google even as looking for a comparable matter, your site came up. It seems great. I have bookmarked it in my google bookmarks to visit then. Hiya, I am really glad I’ve found this info. Nowadays bloggers publish only about gossip and internet stuff and this is actually frustrating. A good blog with exciting content, that’s what I need. Thanks for making this web-site, and I’ll be visiting again. Do you do newsletters by email? Thank you, I have just been searching for info approximately this subject for a long time and yours is the greatest I have came upon till now. However, what about the bottom line? Are you certain concerning the source? Thanks for some other magnificent post. Where else may just anybody get that kind of information in such a perfect method of writing? I have a presentation next week, and I’m on the search for such info. Hiya, I am really glad I’ve found this info. Nowadays bloggers publish only about gossip and web stuff and this is really irritating. A good blog with interesting content, that’s what I need. Thank you for making this site, and I will be visiting again. Do you do newsletters by email? Hiya, I’m really glad I’ve found this information. Today bloggers publish only about gossip and net stuff and this is really annoying. A good site with exciting content, that’s what I need. Thanks for making this site, and I’ll be visiting again. Do you do newsletters by email? Hello there. I discovered your blog by means of Google whilst searching for a similar topic, your web site got here up. It appears great. I’ve bookmarked it in my google bookmarks to visit then. Hello there. I found your blog via Google while searching for a related topic, your website got here up. It looks great. I’ve bookmarked it in my google bookmarks to visit then. Hiya, I’m really glad I have found this info. Nowadays bloggers publish only about gossip and internet stuff and this is really frustrating. A good web site with exciting content, this is what I need. Thank you for making this website, and I will be visiting again. Do you do newsletters by email? Hi there. I found your blog by means of Google while looking for a related topic, your site got here up. It appears to be good. I’ve bookmarked it in my google bookmarks to come back then. Hiya, I am really glad I have found this information. Today bloggers publish just about gossip and web stuff and this is actually annoying. A good website with interesting content, that is what I need. Thanks for making this web-site, and I’ll be visiting again. Do you do newsletters by email? certainly like your website but you need to test the spelling on several of your posts. Many of them are rife with spelling issues and I to find it very troublesome to tell the truth nevertheless I will definitely come again again. Hi there. I discovered your web site by means of Google whilst looking for a related subject, your site got here up. It looks good. I have bookmarked it in my google bookmarks to come back then. Hi there. I discovered your site by means of Google even as searching for a similar matter, your site came up. It appears to be great. I’ve bookmarked it in my google bookmarks to visit then. Hello there. I discovered your site by way of Google at the same time as searching for a similar subject, your website got here up. It appears good. I’ve bookmarked it in my google bookmarks to come back then. Hey there. I discovered your blog by means of Google even as searching for a related subject, your site got here up. It appears to be good. I have bookmarked it in my google bookmarks to visit then. Hiya, I am really glad I’ve found this info. Today bloggers publish only about gossip and internet stuff and this is actually frustrating. A good blog with interesting content, that’s what I need. Thanks for making this web-site, and I’ll be visiting again. Do you do newsletters by email? Hi there. I discovered your web site via Google at the same time as looking for a comparable subject, your web site got here up. It appears great. I’ve bookmarked it in my google bookmarks to visit then. Hey there. I found your web site by means of Google at the same time as looking for a related topic, your website got here up. It appears great. I have bookmarked it in my google bookmarks to come back then. I really wanted to construct a small note so as to appreciate you for the marvelous secrets you are posting on this site. My prolonged internet lookup has now been rewarded with reasonable suggestions to write about with my family and friends. I ‘d say that many of us readers are very much fortunate to be in a remarkable place with many special individuals with very helpful things. I feel very grateful to have discovered your website page and look forward to tons of more excellent times reading here. Thanks a lot once more for everything. Great tremendous things here. I¡¦m very satisfied to look your article. Thank you a lot and i am having a look forward to touch you. Will you kindly drop me a e-mail? Hello there. I found your blog by means of Google at the same time as searching for a comparable topic, your web site came up. It seems great. I have bookmarked it in my google bookmarks to visit then. Hiya, I’m really glad I’ve found this info. Today bloggers publish only about gossip and web stuff and this is really frustrating. A good web site with interesting content, that is what I need. Thanks for making this web-site, and I’ll be visiting again. Do you do newsletters by email? Hiya, I’m really glad I’ve found this information. Today bloggers publish just about gossip and web stuff and this is actually irritating. A good blog with exciting content, this is what I need. Thanks for making this site, and I’ll be visiting again. Do you do newsletters by email? Hiya, I am really glad I have found this information. Today bloggers publish only about gossip and net stuff and this is actually frustrating. A good web site with interesting content, that’s what I need. Thank you for making this web-site, and I’ll be visiting again. Do you do newsletters by email? Hi there. I found your blog by way of Google while searching for a related topic, your website came up. It appears great. I’ve bookmarked it in my google bookmarks to come back then. Hey there. I discovered your site via Google even as looking for a comparable topic, your website got here up. It looks great. I have bookmarked it in my google bookmarks to visit then. Hello there. I discovered your website by way of Google at the same time as searching for a similar matter, your site got here up. It appears to be good. I’ve bookmarked it in my google bookmarks to visit then. Hello there. I discovered your blog via Google while looking for a comparable matter, your site got here up. It appears good. I have bookmarked it in my google bookmarks to visit then. Hello there. I found your site by the use of Google whilst searching for a related subject, your web site came up. It looks good. I have bookmarked it in my google bookmarks to visit then. Hey there. I discovered your web site by the use of Google whilst searching for a similar topic, your site got here up. It appears great. I’ve bookmarked it in my google bookmarks to come back then. Hiya, I am really glad I’ve found this info. Nowadays bloggers publish only about gossip and web stuff and this is actually annoying. A good blog with exciting content, that’s what I need. Thank you for making this website, and I will be visiting again. Do you do newsletters by email? Hi there. I found your web site by the use of Google while searching for a related matter, your site got here up. It seems good. I have bookmarked it in my google bookmarks to visit then. Hiya, I am really glad I’ve found this info. Nowadays bloggers publish just about gossip and internet stuff and this is really frustrating. A good website with exciting content, that is what I need. Thank you for making this site, and I’ll be visiting again. Do you do newsletters by email? Hiya, I’m really glad I have found this info. Nowadays bloggers publish just about gossip and internet stuff and this is actually annoying. A good web site with interesting content, this is what I need. Thank you for making this web site, and I will be visiting again. Do you do newsletters by email? Hiya, I am really glad I have found this info. Nowadays bloggers publish only about gossip and internet stuff and this is actually irritating. A good web site with exciting content, that’s what I need. Thanks for making this web site, and I’ll be visiting again. Do you do newsletters by email? Hi there. I found your web site by way of Google even as looking for a related topic, your website got here up. It appears to be good. I’ve bookmarked it in my google bookmarks to visit then. Hiya, I’m really glad I have found this info. Today bloggers publish only about gossip and web stuff and this is really annoying. A good site with interesting content, that’s what I need. Thank you for making this website, and I will be visiting again. Do you do newsletters by email? Hi there. I found your website by the use of Google while looking for a comparable matter, your site got here up. It appears good. I have bookmarked it in my google bookmarks to come back then. Hi there. I found your web site via Google while searching for a related subject, your web site came up. It appears to be great. I’ve bookmarked it in my google bookmarks to visit then. Hi there. I discovered your web site by means of Google whilst looking for a related subject, your site came up. It seems to be good. I have bookmarked it in my google bookmarks to visit then. Hello there. I found your web site via Google whilst looking for a similar subject, your site got here up. It seems great. I’ve bookmarked it in my google bookmarks to come back then. Hey there. I found your site by the use of Google at the same time as looking for a comparable subject, your site got here up. It appears to be great. I have bookmarked it in my google bookmarks to come back then. Hey there. I found your blog via Google while searching for a similar matter, your website came up. It appears to be great. I have bookmarked it in my google bookmarks to visit then. Hey there. I discovered your site by way of Google while looking for a similar topic, your site came up. It looks great. I’ve bookmarked it in my google bookmarks to visit then. Hiya, I am really glad I have found this info. Today bloggers publish just about gossip and net stuff and this is really annoying. A good blog with interesting content, that’s what I need. Thanks for making this web-site, and I’ll be visiting again. Do you do newsletters by email? Hi there. I found your web site by the use of Google even as looking for a similar topic, your website came up. It seems to be good. I have bookmarked it in my google bookmarks to come back then. I would like to express my passion for your generosity supporting those people that actually need help with this situation. Your very own commitment to getting the message throughout became wonderfully advantageous and have always permitted individuals much like me to get to their desired goals. This important suggestions indicates a lot to me and even further to my fellow workers. With thanks; from each one of us. I was just searching for this information for some time. After 6 hours of continuous Googleing, finally I got it in your web site. I wonder what is the lack of Google strategy that don’t rank this kind of informative web sites in top of the list. Normally the top sites are full of garbage. Hello there. I found your blog by way of Google at the same time as looking for a comparable matter, your website came up. It appears to be great. I have bookmarked it in my google bookmarks to come back then. Hiya, I am really glad I have found this info. Today bloggers publish only about gossip and net stuff and this is really frustrating. A good site with exciting content, that’s what I need. Thank you for making this web-site, and I’ll be visiting again. Do you do newsletters by email? Hi there. I found your web site by way of Google while searching for a comparable topic, your website came up. It looks good. I have bookmarked it in my google bookmarks to visit then. Hey there. I discovered your web site via Google whilst looking for a similar subject, your website came up. It appears good. I’ve bookmarked it in my google bookmarks to come back then. Hey there. I discovered your blog by the use of Google even as searching for a comparable matter, your website got here up. It looks good. I have bookmarked it in my google bookmarks to visit then. Hmm it looks like your blog ate my first comment (it was extremely long) so I guess I’ll just sum it up what I wrote and say, I’m thoroughly enjoying your blog. I as well am an aspiring blog writer but I’m still new to everything. Do you have any helpful hints for first-time blog writers? I’d definitely appreciate it. Hi there. I discovered your website by the use of Google whilst looking for a similar topic, your website got here up. It seems great. I have bookmarked it in my google bookmarks to come back then. Hey there. I found your blog by way of Google even as looking for a related subject, your web site got here up. It looks great. I have bookmarked it in my google bookmarks to come back then. Hiya, I’m really glad I’ve found this info. Nowadays bloggers publish only about gossip and web stuff and this is actually frustrating. A good blog with interesting content, this is what I need. Thank you for making this web site, and I’ll be visiting again. Do you do newsletters by email? Hi there. I found your site via Google even as looking for a related matter, your website got here up. It seems to be great. I’ve bookmarked it in my google bookmarks to come back then. Hi there. I discovered your blog by way of Google while searching for a similar topic, your web site got here up. It appears to be good. I have bookmarked it in my google bookmarks to come back then. Hiya, I’m really glad I have found this info. Today bloggers publish only about gossip and internet stuff and this is actually irritating. A good blog with interesting content, this is what I need. Thanks for making this website, and I will be visiting again. Do you do newsletters by email? Hey there. I discovered your website by way of Google whilst looking for a similar topic, your website came up. It appears to be great. I’ve bookmarked it in my google bookmarks to visit then. Hiya, I’m really glad I’ve found this information. Today bloggers publish just about gossip and net stuff and this is really irritating. A good web site with exciting content, that is what I need. Thank you for making this website, and I’ll be visiting again. Do you do newsletters by email? Hiya, I am really glad I’ve found this information. Today bloggers publish just about gossip and internet stuff and this is really frustrating. A good website with interesting content, that’s what I need. Thanks for making this web site, and I will be visiting again. Do you do newsletters by email? Hiya, I am really glad I’ve found this information. Today bloggers publish just about gossip and net stuff and this is actually annoying. A good blog with interesting content, that is what I need. Thank you for making this site, and I’ll be visiting again. Do you do newsletters by email? Hiya, I am really glad I have found this information. Today bloggers publish only about gossip and internet stuff and this is really frustrating. A good site with interesting content, this is what I need. Thanks for making this web site, and I will be visiting again. Do you do newsletters by email? Admiring the time and effort you put into your blog and detailed information you provide. It’s nice to come across a blog every once in a while that isn’t the same outdated rehashed material. Great read! I’ve bookmarked your site and I’m including your RSS feeds to my Google account. Hey there. I found your web site by means of Google even as searching for a similar matter, your site came up. It appears good. I have bookmarked it in my google bookmarks to come back then. Hi there. I discovered your site by way of Google whilst searching for a similar matter, your site got here up. It appears great. I have bookmarked it in my google bookmarks to come back then. Hiya, I’m really glad I have found this information. Today bloggers publish just about gossip and net stuff and this is actually annoying. A good website with exciting content, this is what I need. Thank you for making this website, and I’ll be visiting again. Do you do newsletters by email? Hiya, I’m really glad I have found this info. Today bloggers publish only about gossip and internet stuff and this is really annoying. A good website with interesting content, that’s what I need. Thank you for making this web-site, and I will be visiting again. Do you do newsletters by email? Hiya, I’m really glad I’ve found this info. Today bloggers publish just about gossip and web stuff and this is actually annoying. A good website with interesting content, that is what I need. Thanks for making this site, and I will be visiting again. Do you do newsletters by email? Hiya, I am really glad I have found this information. Nowadays bloggers publish just about gossip and internet stuff and this is really annoying. A good site with exciting content, that is what I need. Thank you for making this site, and I will be visiting again. Do you do newsletters by email? Hi there. I found your site via Google even as looking for a related topic, your website came up. It seems good. I have bookmarked it in my google bookmarks to visit then. Hiya, I’m really glad I’ve found this information. Today bloggers publish just about gossip and net stuff and this is really frustrating. A good blog with exciting content, that is what I need. Thanks for making this site, and I’ll be visiting again. Do you do newsletters by email? Hey there. I discovered your website by way of Google while searching for a comparable matter, your site got here up. It looks great. I have bookmarked it in my google bookmarks to visit then. Hiya, I am really glad I have found this information. Today bloggers publish just about gossip and web stuff and this is really annoying. A good blog with exciting content, that’s what I need. Thanks for making this site, and I’ll be visiting again. Do you do newsletters by email? Hiya, I am really glad I have found this info. Today bloggers publish just about gossip and net stuff and this is really irritating. A good site with interesting content, this is what I need. Thanks for making this web site, and I’ll be visiting again. Do you do newsletters by email? Hello there. I found your blog by the use of Google whilst searching for a similar subject, your website got here up. It seems good. I’ve bookmarked it in my google bookmarks to visit then. Hey there. I found your website by the use of Google even as searching for a similar matter, your website came up. It seems to be great. I have bookmarked it in my google bookmarks to come back then. Hiya, I am really glad I’ve found this info. Nowadays bloggers publish only about gossip and net stuff and this is really irritating. A good site with interesting content, this is what I need. Thanks for making this web-site, and I’ll be visiting again. Do you do newsletters by email? Hiya, I am really glad I’ve found this information. Today bloggers publish just about gossip and internet stuff and this is actually annoying. A good site with exciting content, this is what I need. Thank you for making this website, and I’ll be visiting again. Do you do newsletters by email? Hello there. I discovered your blog via Google while searching for a comparable matter, your website came up. It appears good. I’ve bookmarked it in my google bookmarks to visit then. Hiya, I am really glad I’ve found this information. Nowadays bloggers publish just about gossip and web stuff and this is really frustrating. A good website with interesting content, that’s what I need. Thank you for making this web-site, and I’ll be visiting again. Do you do newsletters by email? Hi there. I found your website by way of Google whilst searching for a similar subject, your site came up. It appears to be good. I’ve bookmarked it in my google bookmarks to visit then. Hello there. I found your web site by way of Google even as looking for a related topic, your web site came up. It seems great. I’ve bookmarked it in my google bookmarks to come back then. Hiya, I am really glad I have found this info. Nowadays bloggers publish only about gossip and internet stuff and this is really annoying. A good website with interesting content, this is what I need. Thanks for making this web-site, and I will be visiting again. Do you do newsletters by email? Hiya, I’m really glad I have found this info. Nowadays bloggers publish only about gossip and net stuff and this is actually annoying. A good web site with exciting content, that’s what I need. Thank you for making this web site, and I’ll be visiting again. Do you do newsletters by email? Hey there. I found your web site by means of Google at the same time as searching for a similar topic, your site got here up. It appears good. I have bookmarked it in my google bookmarks to visit then. Hi there. I found your web site by way of Google even as searching for a related subject, your site came up. It looks great. I’ve bookmarked it in my google bookmarks to come back then. Hiya, I’m really glad I have found this information. Nowadays bloggers publish only about gossip and net stuff and this is actually frustrating. A good site with exciting content, this is what I need. Thank you for making this website, and I’ll be visiting again. Do you do newsletters by email? Hey there. I found your site by way of Google even as searching for a similar subject, your web site came up. It appears to be great. I have bookmarked it in my google bookmarks to come back then. Hiya, I’m really glad I have found this information. Nowadays bloggers publish just about gossip and internet stuff and this is really frustrating. A good website with exciting content, this is what I need. Thanks for making this website, and I’ll be visiting again. Do you do newsletters by email? Hey there. I discovered your site by the use of Google even as searching for a related subject, your website came up. It looks good. I have bookmarked it in my google bookmarks to come back then. I have read some excellent stuff here. Definitely worth bookmarking for revisiting. I surprise how a lot attempt you place to make the sort of magnificent informative web site. Hello there. I found your website by means of Google whilst searching for a comparable matter, your web site got here up. It seems to be great. I have bookmarked it in my google bookmarks to come back then. Hiya, I am really glad I’ve found this information. Nowadays bloggers publish only about gossip and web stuff and this is actually frustrating. A good blog with exciting content, that’s what I need. Thanks for making this website, and I’ll be visiting again. Do you do newsletters by email? Hiya, I am really glad I have found this info. Today bloggers publish only about gossip and net stuff and this is actually frustrating. A good website with exciting content, that’s what I need. Thanks for making this website, and I’ll be visiting again. Do you do newsletters by email? Hey there. I discovered your blog by means of Google at the same time as looking for a related subject, your website came up. It seems to be great. I have bookmarked it in my google bookmarks to visit then. Hi there. I discovered your website by the use of Google while searching for a related subject, your web site got here up. It seems great. I have bookmarked it in my google bookmarks to come back then. What is the very best application for posting blogs or articles to my site? Hey there. I found your blog by the use of Google at the same time as looking for a related subject, your site came up. It seems great. I’ve bookmarked it in my google bookmarks to visit then. Hello there. I discovered your web site by the use of Google while searching for a comparable matter, your web site got here up. It looks great. I have bookmarked it in my google bookmarks to come back then. Hi there. I discovered your website by the use of Google even as looking for a comparable matter, your web site came up. It seems good. I have bookmarked it in my google bookmarks to visit then. Hey there. I found your site via Google while looking for a comparable matter, your website came up. It looks great. I have bookmarked it in my google bookmarks to come back then. Hey there. I found your website by way of Google at the same time as searching for a related topic, your site came up. It appears to be great. I’ve bookmarked it in my google bookmarks to visit then. Hi there. I discovered your web site via Google even as looking for a related subject, your website got here up. It appears great. I’ve bookmarked it in my google bookmarks to come back then. Hiya, I’m really glad I have found this info. Today bloggers publish just about gossip and net stuff and this is actually frustrating. A good site with interesting content, this is what I need. Thank you for making this web site, and I’ll be visiting again. Do you do newsletters by email? Hey there. I discovered your website via Google while looking for a related matter, your website got here up. It appears great. I have bookmarked it in my google bookmarks to come back then. Hey there. I found your website via Google while searching for a similar subject, your web site came up. It looks great. I’ve bookmarked it in my google bookmarks to visit then. Hey there. I discovered your web site by way of Google while searching for a related subject, your web site got here up. It looks great. I have bookmarked it in my google bookmarks to come back then. Hello there. I discovered your site via Google while looking for a related topic, your site got here up. It appears to be great. I have bookmarked it in my google bookmarks to come back then. Hiya, I am really glad I have found this information. Nowadays bloggers publish only about gossip and web stuff and this is really frustrating. A good website with exciting content, that is what I need. Thank you for making this site, and I will be visiting again. Do you do newsletters by email? Hi there. I found your site by way of Google at the same time as searching for a comparable topic, your web site came up. It appears to be good. I’ve bookmarked it in my google bookmarks to visit then. Hey there. I discovered your web site via Google while looking for a comparable matter, your site came up. It seems to be great. I’ve bookmarked it in my google bookmarks to come back then. Hi there. I found your blog via Google at the same time as searching for a related matter, your web site came up. It appears good. I’ve bookmarked it in my google bookmarks to visit then. Hiya, I’m really glad I’ve found this info. Nowadays bloggers publish just about gossip and web stuff and this is really irritating. A good blog with interesting content, this is what I need. Thanks for making this website, and I will be visiting again. Do you do newsletters by email? Hiya, I’m really glad I’ve found this info. Nowadays bloggers publish just about gossip and internet stuff and this is really frustrating. A good site with interesting content, this is what I need. Thanks for making this web-site, and I’ll be visiting again. Do you do newsletters by email? Hello there. I discovered your blog by the use of Google while searching for a related subject, your site got here up. It appears to be great. I have bookmarked it in my google bookmarks to come back then. I’ve been surfing online more than three hours today, yet I never found any attention-grabbing article like yours. It¡¦s beautiful worth enough for me. In my opinion, if all webmasters and bloggers made good content as you probably did, the web will be a lot more useful than ever before. Hiya, I’m really glad I have found this info. Today bloggers publish just about gossip and web stuff and this is really irritating. A good blog with exciting content, that is what I need. Thank you for making this web-site, and I’ll be visiting again. Do you do newsletters by email? Hello there. I found your blog by means of Google even as looking for a similar matter, your site got here up. It seems great. I’ve bookmarked it in my google bookmarks to come back then. Hey there. I found your website by the use of Google whilst looking for a similar subject, your website got here up. It appears good. I have bookmarked it in my google bookmarks to come back then. Hi there. I found your website via Google while searching for a related topic, your site got here up. It appears to be good. I’ve bookmarked it in my google bookmarks to come back then. Hiya, I’m really glad I’ve found this information. Nowadays bloggers publish only about gossip and web stuff and this is actually irritating. A good web site with interesting content, that is what I need. Thanks for making this site, and I’ll be visiting again. Do you do newsletters by email? Hiya, I’m really glad I have found this information. Today bloggers publish just about gossip and net stuff and this is actually frustrating. A good blog with interesting content, that is what I need. Thanks for making this site, and I’ll be visiting again. Do you do newsletters by email? Hello there. I discovered your website by the use of Google even as looking for a comparable subject, your website came up. It looks great. I have bookmarked it in my google bookmarks to visit then. Hello there. I found your website by the use of Google even as looking for a comparable topic, your web site got here up. It seems to be great. I have bookmarked it in my google bookmarks to visit then. Good ¡V I should certainly pronounce, impressed with your web site. I had no trouble navigating through all the tabs and related information ended up being truly simple to do to access. I recently found what I hoped for before you know it at all. Reasonably unusual. Is likely to appreciate it for those who add forums or something, website theme . a tones way for your client to communicate. Excellent task..
Hiya, I’m really glad I’ve found this info. Nowadays bloggers publish just about gossip and net stuff and this is really frustrating. A good web site with interesting content, that’s what I need. Thank you for making this website, and I will be visiting again. Do you do newsletters by email? Hello there. I discovered your site via Google while searching for a similar topic, your web site came up. It appears to be great. I have bookmarked it in my google bookmarks to come back then. Hey there. I discovered your web site by the use of Google even as looking for a related matter, your website came up. It appears great. I have bookmarked it in my google bookmarks to come back then. Hello there. I discovered your web site by the use of Google at the same time as searching for a related matter, your website got here up. It appears to be good. I have bookmarked it in my google bookmarks to come back then. Hey there. I discovered your site by the use of Google even as searching for a similar topic, your website got here up. It seems to be great. I’ve bookmarked it in my google bookmarks to visit then. Hiya, I’m really glad I’ve found this info. Today bloggers publish just about gossip and web stuff and this is actually annoying. A good website with interesting content, that is what I need. Thanks for making this website, and I’ll be visiting again. Do you do newsletters by email? Hiya, I am really glad I’ve found this information. Nowadays bloggers publish only about gossip and web stuff and this is really annoying. A good web site with exciting content, that’s what I need. Thank you for making this web-site, and I’ll be visiting again. Do you do newsletters by email? Hey there. I discovered your blog by way of Google while looking for a comparable matter, your website came up. It looks great. I’ve bookmarked it in my google bookmarks to come back then. Hey there. I found your web site by the use of Google at the same time as searching for a similar subject, your web site came up. It looks great. I have bookmarked it in my google bookmarks to come back then. Hi there. I found your site by means of Google whilst looking for a comparable subject, your site came up. It seems great. I’ve bookmarked it in my google bookmarks to visit then. Hey there. I found your website by way of Google at the same time as looking for a comparable topic, your website got here up. It appears to be good. I’ve bookmarked it in my google bookmarks to visit then. Hiya, I am really glad I’ve found this info. Nowadays bloggers publish just about gossip and web stuff and this is actually frustrating. A good site with exciting content, that is what I need. Thank you for making this web site, and I will be visiting again. Do you do newsletters by email? Hello there. I found your website by way of Google at the same time as searching for a related matter, your website got here up. It looks great. I’ve bookmarked it in my google bookmarks to visit then. Hello there. I discovered your site by means of Google whilst searching for a related topic, your web site got here up. It seems great. I’ve bookmarked it in my google bookmarks to visit then. Hello there. I found your web site via Google even as looking for a related topic, your website got here up. It looks great. I have bookmarked it in my google bookmarks to visit then. Hi there. I discovered your website by the use of Google at the same time as looking for a similar matter, your site got here up. It seems great. I have bookmarked it in my google bookmarks to visit then.